These pages will take a little longer to load since they contain all of our on-line selections of gemstones for all minerals. NOTE: If the gemstone images on this page do not load properly (or if they take too long to load! ), then you should visit our Gemstones Alphabetical Index where there are links to separate pages for gemstones of each mineral variety. The images of our gemstones on these specific mineral variety pages will load much faster. See also our page displaying only Rare Collector Gemstones and Very Fine Quality Gemstones! Simply "click" on any image below to enlarge it. Our gemstones are sold and replaced on a daily basis, so do come back often! This genuine alexandrite gemstone has a strong color change from medium green in daylight (see lower photo) to reddish purplish hues under incandescent light (see upper photo). This natural alexandrite gemstone was faceted from a natural alexandrite crystal that was mined in Brazil. This completely natural alexandrite gem has not been heated or treated in any way. This alexandrite gem is eye clean other than some natural cats eye chatoyancy at certain angles. This genuine alexandrite gemstone has a fairly good color change from a nice medium green in daylight (see lower photo) to light purplish hues under incandescent light (see upper photo). This natural alexandrite gemstone was faceted from a natural alexandrite crystal that was mined in Brazil. This completely natural alexandrite gem has not been heated or treated in any way. This alexandrite gem has some faintly eye visible natural inclusions. This genuine alexandrite gemstone has a strong color change from a fine slightly blue-ish green in reflected sunlight as shown at left, to a deep reddish-purple under incandescent light (100% natural colors - this genuine alexandrite gemstone is unheated and untreated). This natural alexandrite gemstone faces up completely eye clean other than some faint cats eye chatoyancy visible at certain angles (GIA: Type II Gem, Clarity Grade: VS). This natural alexandrite gemstone is very well faceted slightly deep with good brilliance. Our mineralminers.com special offer price for this natural alexandrite gemstone is $5500./carat x 1.32 carats = $7260. The GIA natural alexandrite Certificate will accompany this gem when sold. See a view of this natural alexandrite gemstone under incandescent light showing some natural chatoyance. See also a side view of this GIA Certified Natural Alexandrite Gemstone. This genuine alexandrite gemstone has a very good color change from rich green in daylight to reddish-purple under incandescent light (100% natural colors - this genuine alexandrite gemstone is unheated and untreated). 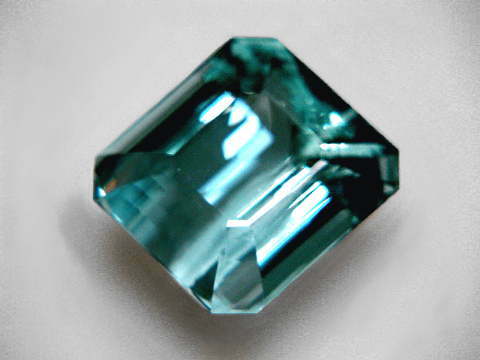 This moderately included alexandrite gemstone is semi-transparent to transparent (GIA: Type II Gem, Clarity Grade: I). Due to its inclusions, it is a relatively inexpensive gem for jewelry use in a ring or pendant, and it also would make a relatively inexpensive very good color change alexandrite gemstone for a gemstone collection. The photo at left is a back-lit view taken under daylight, see a view of this natural alexandrite gemstone under incandescent light. See also a side view of this natural color change alexandrite gemstone taken under daylight. 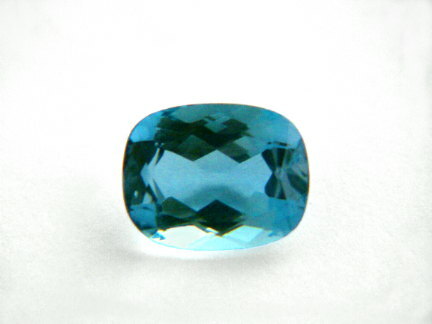 This natural alexandrite gemstone is well faceted in a deep cut. Our mineralminers.com special offer price for this natural alexandrite gemstone is $1500./carat x 0.94 carats = $1410. 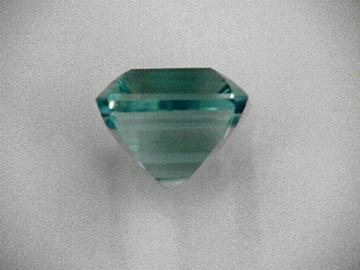 This genuine alexandrite faceted gemstone has a excelent color change from rich blue-green in daylight as shown in the photo at left to a reddish-violet under incandescent light This gem was native cut and has good depth, being deeper at one end with no window. This moderately included natural alexandrite gem faces up nearly eye-clean with natural inclusions visible under very close inspection. These natural inclusions guarantee this gem's natural origin. Our mineralminers.com special offer price for this natural alexandrite gem is less than $2500/carat, at $2900.00 total price. See also side view photo of this natural alexandrite gemstone. Natural Alexandrite Gemstones, sold individually at $140.00 ea. These oval, faceted, genuine alexandrite gemstones have a good color change from green in daylight (see upper photo) to reddish-purple hues under incandescent light (see lower photo). Each gem weighs 0.10 carat or more. These natural alexandrite gemstones face up eye clean with faint natural inclusions possibly visible under very close inspection or magnification. They were all cut from natural alexandrite crystals that were mined in Brazil. These completely natural alexandrite gems have not been heated or treated in any way. Our mineralminers.com miners price for these natural alexandrite gemstones is $140.00 for each gemstone. This genuine alexandrite gemstone has a good color change from medium green in daylight (see right photo) to reddish-purple hues under incandescent light (see left photo). This natural alexandrite gemstone faces up eye clean with faint natural inclusions visible under magnification. It was well cut from a natural alexandrite crystal that was mined in Brazil. This completely natural alexandrite gem has not been heated or treated in any way. Our mineralminers.com miners price for this natural alexandrite gemstone is $1900./carat x 0.30 carats = $570. This genuine alexandrite faceted gemstone has a very good color change from a pleasant blue-green in daylight as shown in the photo at left to a pinkish purple under incandescent light. 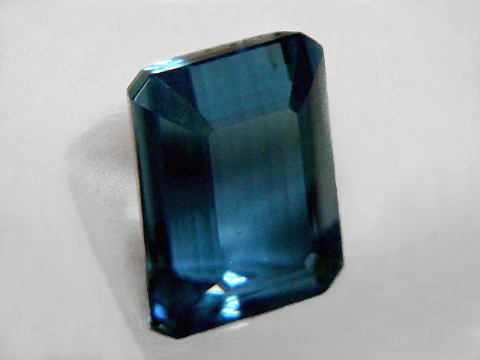 This gem was native cut and is cut deeper than necessary for its width, and it is very clean for natural alexandrite. It faces up eye-clean, to the unaided eye, how ever there are natural inclusions visible under very close inspection which guarantees this gem's natural origin, (GIA: Type II Gem, Clarity Grade: (VS). This genuine alexandrite gem has 100% natural colors - it is unheated and untreated. Our mineralminers.com special offer price for this natural alexandrite gem is $2850.00. This genuine alexandrite faceted gemstone has a very good color change from a pleasant, beautiful, deep, slightly yellowish green in daylight as shown in the photo at left to a medium brown red under incandescent light This gem was very nicely cut and has very good proportions. It is very clean for natural alexandrite. It faces up completely eye-clean, to the unaided eye. There are natural inclusions visible only under magnification which guarantees this gem's natural origin. Our mineralminers.com special offer price for this natural alexandrite gem is $3270.00. This genuine alexandrite faceted gemstone has a good color change from a pleasant, beautiful, medium tone yellowish green in daylight as shown in the photo at left to a medium gray purple under incandescent light. This gem was very nicely cut and has very good proportions. It is exceptionally clean for natural alexandrite. It faces up completely eye-clean, to the unaided eye. There are natural inclusions visible under magnification which guarantees this gem's natural origin. Our mineralminers.com price for this natural alexandrite gem is $5200.00/per carat = $11960. The G.I.A. Certification report will be included with the purchase of this gemstone. This genuine alexandrite faceted gemstone has a strong color change from a deep, very dark tone blue-green in reflected daylight as shown in the photo at left to a deep tone of reddish purple under incandescent light. This gem was very nicely cut and has very good proportions. Upon close inspection it has noticeable inclusions with one surface reaching feature showing indication of clarity enhancement. It faces up nearly eye-clean, to the unaided eye. There are natural inclusions easily visible under magnification which guarantees this gem's natural origin. Our mineralminers.com special offer price for this natural alexandrite gem is $4200.00/per carat = $11718.00. The G. I. A. Certification report will be included with the purchase of this gemstone. This rare size natural alexandrite gem weighs 7.43 carats! This rare, large size, genuine alexandrite faceted gemstone has a good color change from a pleasant, beautiful, medium tone yellowish green in daylight as shown in the photo at left to a purplish brown under incandescent light. There is no bleed through into the green day light color, it stays a nice even green throughout. This rare gem was very nicely cut and pollished with reasonably good proportions (slightly deep). It is exceptionally clean for natural alexandrite. It faces up completely eye-clean. There are natural inclusions visible only under very high magnification which guarantees this gem's natural origin. See also a side view photo of this natural alexandrite gemstone Our mineralminers.com special offer price for this natural alexandrite gem is $4200.00/per carat = $31206.00. The G.I.A. Certification report will be included with the purchase of this gemstone. This beautiful amethyst collector gemstone is very well faceted as a 74.92 carat pear shape gem from natural color very light purple amethyst rough that was mined at Maraba, Brazil. Light purple natural color amethyst is popularly known as rose de France amethyst. This genuine rose de France amethyst collector gem has a very faint natural plane inclusion near the girdle at one edge, and it is otherwise totally clean under close inspection. See a close-up view under bright illumination showing this faint plane in the girdle area of this rose de France amethyst gemstone. This rose de France gem has very even color throughout with no color zoning. This rare size rose de France amethyst collector gem has not been heated or treated in any way! 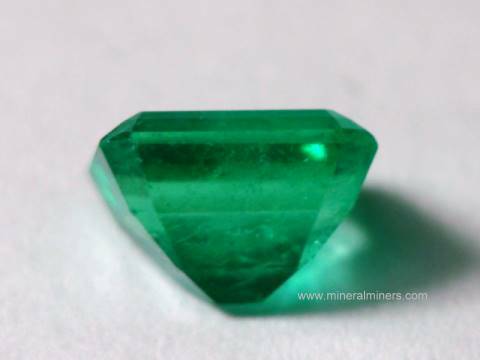 Our mineralminers.com special offer price for this untreated collector gem is $3.15/carat = $236. Flawless 221.95 carat Natural Light Amethyst Gemstone! This natural color amethyst gem was faceted in a designer, modified cut corner triangle cut. It was faceted in Brazil from a natural amethyst crystal mined at Maraba, Brazil. This natural amethyst gem is eye clean, and it has rich medium dark purple color (100% natural color). This amethyst gem was faceted in Brazil from natural amethyst rough mined at Maraba, Brazil. This fine quality gem was very well fashioned. It is very clean with only minor natural inclusions possibly seen only with back lighting or magnification. The color is a fine medium purple with blue and reddish flashes under bulb light. (100% natural color). This is a beautiful gem for custom or antique style jewelry. This amethyst gem was faceted from natural amethyst rough mined at Maraba, Brazil. This fine quality gem was very well cut with good proportions. It is exceptionally clean to the unaided eye, with minor natural inclusions seen only with high magnification. The color is a fine medium dark purple with blue and reddish flashes under bulb light. (100% natural color). This is a beautiful gem for a pendant or a large ring. This dark amethyst gemstone was faceted into this oval cut gem from natural color dark purple amethyst rough that was mined in Brazil. It is unheated and untreated. This fine quality amethyst gem has no eye visible inclusions. This large marquise cut amethyst gem was nicely faceted in Brazil from natural amethyst rough mined at Maraba, Brazil. This natural amethyst gem is completely clean even at ten times magnification, and it has beautiful medium dark purple color (100% natural color) with both reddish and blueish flashes as the gem or the light source is moved. This natural color amethyst gem was faceted in a designer, modified cut corner triangle cut. It was faceted in Brazil from a natural amethyst crystal mined at Maraba, Brazil. This natural amethyst gem is completely eye clean, and it has rich medium dark purple color (100% natural color).It would make into a beautiful pendant. This amethyst gem was very well faceted in the step cut fashion from natural amethyst rough mined at Maraba, Brazil. This fine quality gem was very well cut with good proportions. It is very clean to the unaided eye. The color is a fine deep purple with bluish and deep pink flashes under bulb light. (100% natural color). See an upside down photo of this natural amethyst gemstone. This natural color amethyst gem was very well faceted in a modified round brilliant fashion. It was faceted in Brazil from a natural amethyst crystal mined at Maraba, Brazil. This natural amethyst gem is completely eye clean, and it has rich dark purple color with bluish and reddish flashes under incandescent light (100% natural color).It would make into a beautiful piece of jewelry. This amethyst gem was faceted from natural amethyst rough mined at Maraba, Brazil. This fine quality gem was very well cut with good proportions. It is exceptionally clean to the unaided eye, with minor natural inclusions seen only with high magnification. The color is a fine medium dark purple with blue and pinkish flashes under bulb light. (100% natural color). This is a beautiful gem for a pendant or a large ring. This ametrine gemstone was faceted from a natural color ametrine crystal that was mined in Bolivia. This cushion cut gem is totally clean even under magnification, and it is nicely calibrated at 11.0mm x 9.1mm. It has natural golden citrine color with a natural color purple amethyst color zone in the middle (100% natural colors: this genuine ametrine gemstone has not been heated or treated in any way). This genuine ametrine gemstone was faceted from a natural color ametrine crystal that was mined in Bolivia. This square cushion cut gem is totally clean even at 10 times magnification, and it was exceptionally well cut with excellent brilliance and a checkerboard faceted top. It has areas with both natural color golden citrine and natural purple amethyst color (100% natural colors: this fine quality ametrine gemstone has not been heated or treated in any way). This genuine ametrine gemstone was very well faceted with a checkerboard top from a natural color ametrine crystal that was mined in Bolivia. This 16.79 carat cushion cut gem is totally clean even at 10 times magnification! It has areas with both natural color golden citrine and natural purple amethyst color. These are 100% natural colors: this fine quality ametrine gemstone has not been heated or treated in any way. This beautiful cabochon was hand-crafted in the U.S.A. from natural blue apatite in jasper rough. The apatite is an intense blue, contrasting nicely with the light brown jasper matrix. This blue apatite in jasper cabochon has two good sized apatites visible on its highly polished surface, one is a large deep blue apatite, and the other is a large lighter blue apatite that shows some chatoyancy. This genuine aquamarine gemstone was faceted from a natural aquamarine crystal that was mined in Minas Gerais, Brazil. It appears to be colorless, however when placed upside down on a white background it shows a very faint trace of pale icy blue color that is 100% natural, it has not been heated or treated in any way. This natural aquamarine gemstone is completely eye clean (GIA: Type I Gem, Clarity Grade: VVS). It is well cut with good brilliance. See also a side view of this natural aquamarine gem. Our mineralminers.com special offer price for this completely natural aquamarine gemstone is $60/carat = $174. These natural color aquamarine gemstones were faceted from genuine aquamarine crystals that were mined in Minas Gerais, Brazil. They each measure 10x8mm, and they have very pale silvery blue color (almost colorless) that is 100% natural, they has not been heated or treated in any way. These genuine aquamarine gemstones face up eye clean with faint natural inclusions visible under close inspection (GIA: Type I Gem, Clarity Grade: VS). This genuine aquamarine gemstone was faceted from a natural aquamarine crystal that was mined in Minas Gerais, Brazil. It has light to medium blue color that is 100% natural, it has not been heated or treated in any way. It is well faceted in a shallow cut with some windowing. This natural aquamarine gemstone faces up eye clean with faint natural needle inclusions visible only under very close inspection with bright illumination (GIA: Type I Gem, Clarity Grade: VS). Our mineralminers.com miners price for this completely natural aquamarine gemstone is $134.25/carat = $355.76. This natural aquamarine gemstone is well cut in a heart shape with good brilliance. It was faceted from a natural aquamarine crystal that was mined in Brazil. This superior quality aquamarine gemstone is eye clean (GIA: Type I, Clarity Grade: VS). This wonderful gem has beautiful light blue natural color - this genuine aquamarine gemstone is unheated and untreated. This genuine aquamarine gemstone is well cut as a triangular shape gem with good brilliance from a natural aquamarine crystal that was mined in Brazil. This fine quality aquamarine gemstone is completely eye clean even under very close inspection (GIA: Type I, Clarity Grade: VVS). This beautiful aquamarine gem has light blue natural color - this genuine aquamarine gemstone is unheated and untreated. This untreated aquamarine gemstone is very well faceted in a pear shape with good brilliance from a natural aquamarine crystal that was mined in Brazil. This fine quality natural aquamarine gemstone is eye clean (GIA: Type I, Clarity Grade: VS), and it has beautiful medium blue natural color. 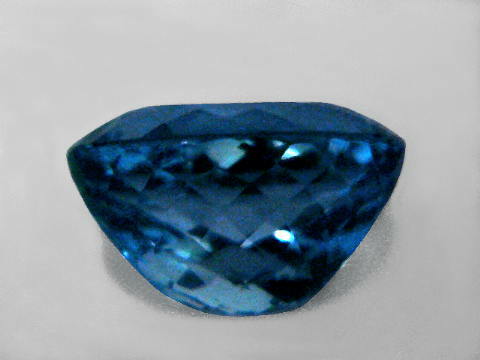 This aquamraine gem is unheated and untreated. This natural aquamarine gemstone is very well faceted as a princess cut gem with very good brilliance from a natural aquamarine crystal that was mined in Brazil. This fine quality aquamarine gemstone is completely eye clean even under very close inspection with bright illumination (GIA: Type I, Clarity Grade: VS). This wonderful gem has beautiful light icy blue natural color - this genuine aquamarine gemstone is unheated and untreated. This natural aquamarine gemstone is very well faceted as a princess cut gem with very good brilliance from a natural aquamarine crystal that was mined in Brazil. This beautiful aquamarine gem faces up eye clean clean (GIA: Type I, Clarity Grade: VS). Under very close inspection with bright illumination, it shows a few very faint tiny natural inclusions. This lovely gem has beautiful pale blue natural color - this genuine aquamarine gemstone is unheated and untreated. This matching pair of untreated aquamarine gemstones is very well faceted as pear shaped gems with very good brilliance. These fine quality aquamarines were cut from a natural aquamarine crystal that was mined in Brazil. These aquamarine gemstones face up completely clean (GIA: Type I, Clarity Grade: VS). They have light to medium blue natural color - these genuine aquamarine gemstones are unheated and untreated. They would make a beautiful matched pair of genuine aquamarine earrings. This natural aquamarine gemstone is very well faceted with excellent brilliance in this 9.4mm trillion cut aquamarine gem from a natural aquamarine crystal that was mined in Minas Gerais, Brazil. This fine quality aquamarine gemstone is totally clean even under very close inspection! It has lovely light blue natural color - it is unheated and untreated. This untreated aquamarine gemstone is very well faceted in this oval shaped gem with excellent brilliance from a natural aquamarine crystal that was mined in Minas Gerais, Brazil. This superior quality aquamarine gemstone is completely eye clean. This unheated aquamarine gem has beautiful light blue natural color. 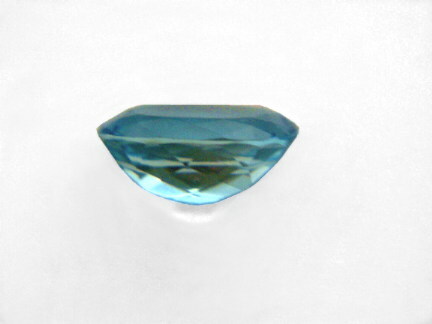 This oval shaped aquamarine gemstone would make a wonderful aquamarine pendant! 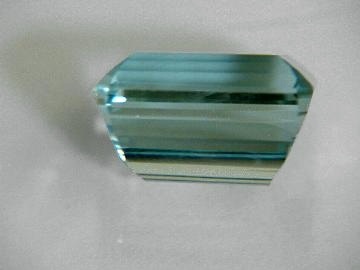 This natural aquamarine gemstone is very well faceted in this 11.1mm trillion cut aquamarine gemstone. It was faceted from a natural aquamarine crystal that was mined in Minas Gerais, Brazil. This fine quality aquamarine gemstone is totally clean even under very close inspection! It has lovely light blue natural color - it is unheated and untreated. This natural color aquamarine gemstone was very well faceted as a cushion cut gem with good brilliance from a natural aquamarine crystal that was mined in Minas Gerais, Brazil. This fine quality aquamarine gemstone has rare medium blue natural color, and it faces up eye clean with very faint natural inclusions only visible with bright illumination and very close inspection (GIA: Type I, Clarity Grade VS). 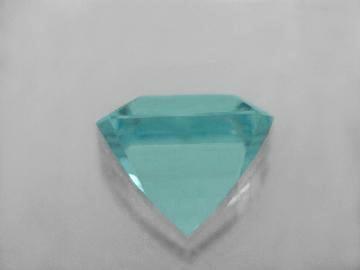 This natural color aquamarine gemstone is very well faceted in a long oval cut gem. This fine quality aquamarine gemstone has light to medium blue natural color, and it is completely clean even under close examination with magnification (GIA: Type I, Clarity Grade: flawless). This natural aquamarine gemstone was very well faceted into this calibrated 9x7mm pear shape gem with very good brilliance from a natural aquamarine crystal that was mined in Nigeria. This untreated aquamarine gemstone faces up eye clean, with faint natural inclusions visible only under very close inspection. It has beautiful light blue natural color (this natural aquamarine gemstone is unheated and untreated). This pear shape aquamarine gemstone would make a wonderful aquamarine pendant! This natural light green aquamarine gemstone with a good quality cats-eye effect was mined in Brazil. It is 100% natural color. This large, green aqua cats-eye weighs 50.7 carats, and shows a good cats-eye effect under sun light or a single incandescent light source. 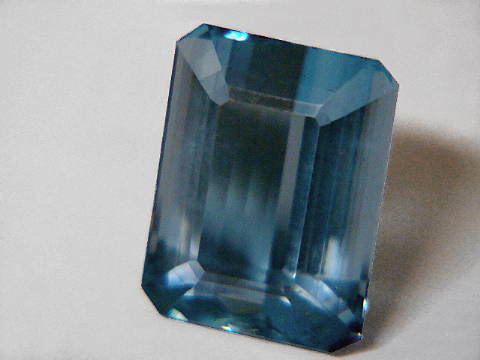 See also a side-view photo of this genuine aquamarine gemstone. We are offering this natural green aqua gem at a special offer price of $1825.20. 12x10mm Aquamarine Cabs, sold individually at $97.69 ea. These natural color medium-dark blue aquamarine gemstones are very fine quality cabochon gems. They are 100% natural color. Each of these 12x10mm natural blue aquamarine gemstones weigh over 4.80 carats, and there are some great matching pairs for making aquamarine earrings! We are offering these natural blue aquamarine gemstones individually at a special offer price of $97.69 each. 13x9mm Pear Shape Aquamarine Cabs, sold individually at $82.00 ea. These are natural color medium-dark blue aquamarine cabochon gemstones. They are very fine quality cabs that were mined and polished in Brazil, all with 100% natural color. These 13x9mm pear shape aquamarine gemstones all weigh over 4 carats each. They would make great pendant or ring center stones! They are very similar in color to item number aqug183. We are offering these natural blue aquamarine gemstones individually at a special offer price of $82 each. See also a hand-held view taken under daylight of this rare quality aquamarine gemstone, as well as another close-up of this aquamarine gemstone hand-held under daylight. Aquamarine gemstone dimensions: 13.0mm x 11.0mm E.C. 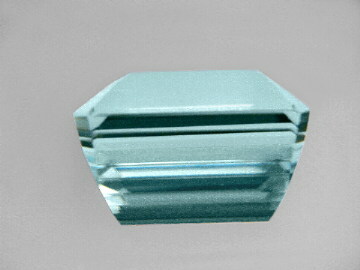 Aquamarine gemstone dimensions: 15.75mm x 12.25mm E.C. This untreated aquamarine gemstone is very well cut in a cut corner emerald shape with excellent brilliance from a natural aquamarine crystal that was mined in Minas Gerais, Brazil. See an end-view photo of this genuine aquamarine gemstone. It has a medium tone of slightly greenish blue 100% natural color, it has not been heated or treated in any way. 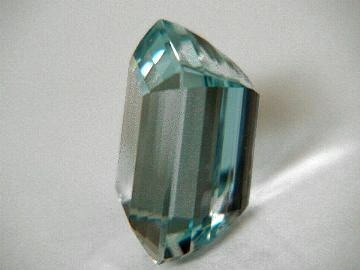 See also a side-view photo of this genuine aquamarine gemstone. This natural aquamarine gem faces up eye-clean. It has very faint natural inclusions that are only visible under high magnification. 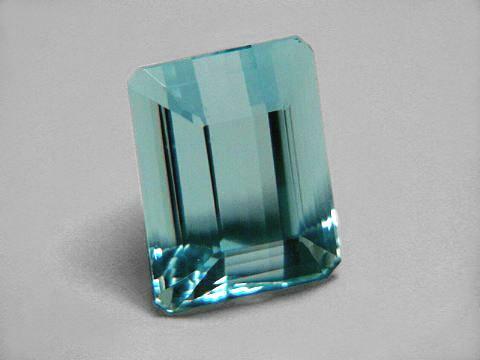 See also a side-angle view photo of this natural aquamarine gemstone. Our mineralminers.com miner's price for this natural aquamarine gemstone is $170./carat = $2536. This untreated aquamarine gemstone was very well cut in a heart shape with excellent brilliance from a natural aquamarine crystal that was mined in Minas Gerais, Brazil. It has light to medium blue 100% natural color, it has not been heated or treated in any way. This natural aquamarine gemstone faces up eye-clean. It has very faint natural inclusions that are only visible under magnification. This heart shape aquamarine gemstone would make a wonderful aquamarine necklace! Our mineralminers.com miner's price for this natural aquamarine gemstone is $125./carat = $1049. 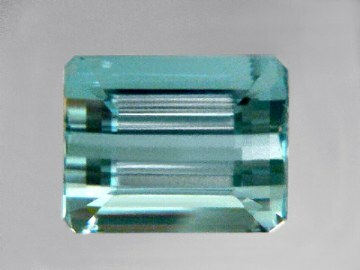 Aquamarine gemstone dimensions: 16.3mm x 12.6mm x 8.9 E.C. Aquamarine gemstone dimensions: 16.0mm x 12.8mm x 9.5 mm E.C. Aquamarine gemstone dimensions: 12.9mm x 10.1mm x 6.2mm C.C. This rare red beryl gem (also known as "bixbite" or "red emerald") was faceted from a natural color red beryl crystal mined at the Violet Claim in Utah, USA. This nicely cut red beryl gem weighs 0.20 carats and it is nearly eye-clean and shows no evidence of any treatments. It has intense, deep red color with faint violet tones. This rare red beryl gem (also known as "bixbite" or "red emerald") was fashioned in a buff top style from a natural color red beryl crystal mined at the Violet Claim in Utah, USA. This nicely cut red beryl gem weighs 0.33 carats and it is nearly eye-clean and shows no evidence of any treatments. It has intense, deep red color with a very faint orangy tone. See also a side-view of this red beryl gemstone. This natural golden beryl gem was faceted from a natural color heliodor crystal mined at Padre Paraiso, Brazil in the year 2000. This beautiful gem is completely clean even under very close inspection, and it has very fine deep golden natural color. This natural heliodor gem was faceted from a natural color heliodor crystal mined at Padre Paraiso, Brazil in the year 2000. This oval shape gem is well cut with good brilliance. It is completely clean even under very close inspection, and it has very nice light to medium yellow natural color. This amazing heliodor gemstone (also known as golden beryl) was precision faceted into this calibrated checkerboard oval cut gem with a concave faceted backside from a natural heliodor crystal mined at Rangkul, Tajikistan. Its concave faceted backside gives this gem truly fantastic brilliance. This heliodor gem faces up eye clean (GIA Type I Gem, Clarity Grade VS-SI) with some very faint natural inclusions that are only visible under close inspection with bright illumination. This beautiful heliodor gem has intense golden yellow color (100% natural color). This oval cut heliodor gemstone (also known as golden beryl) was well faceted from a natural heliodor crystal mined at Padre Paraiso, Brazil. It is eye clean, and it has very strong greenish gold color (100% natural color). This rare quality heliodor gemstone (also known as golden beryl) was custom fashioned into this golden orange color cats-eye beryl gem from a natural heliodor crystal containing fine silky needles mined in Minas Gerais, Brazil. (100% natural color). This genuine heliodor (golden beryl) gemstone faces up exceptionally clean, for a cats-eye gem with an excellent quality straight line eye, and it was very well shaped and finished with good luster. This natural color goshenite gemstone was faceted from a colorless beryl crystal that was mined in Minas Gerais, Brazil. It is colorless, and it has not been heated or treated in any way. This natural color goshenite gem faces up eye clean (GIA: Type I Gem, Clarity Grade: VS). It is well cut with good brilliance. Our mineralminers.com special offer price for this completely natural goshenite gemstone is $50/carat = $116. This very pale pink morganite gem was faceted from a natural color pink beryl crystal that was mined in Minas Gerais, Brazil. The pink color of this gem is so pale that it appears almost colorless. This oval shaped morganite gem faces up eye clean with faint natural inclusions visible only under under close inspection, and it is well cut with superior brilliance. This very pale pink morganite gem was faceted from a natural color pink beryl crystal that was mined in Minas Gerais, Brazil. The pink color of this gem is so pale that it is almost colorless. This round shaped morganite gem faces up eye clean with faint natural inclusions visible under closer inspection, and it is well cut with superior brilliance. This natural pink morganite gem was faceted from a natural color light pink beryl crystal that was mined in Minas Gerais, Brazil in 2001. The beautiful color of this fine quality morganite gem is completely natural - it is unheated and untreated. This fine quality morganite gem is very well cut with very good brilliance, and it is totally clean to the eye! This natural color light peach-pink color morganite gem was faceted from a natural pink-peach beryl crystal that was mined in Minas Gerais, Brazil. The light peach-pink color of this gem is completely natural - it is both unheated and untreated. This rare quality morganite gem was nicely cut with good brilliance, and it is totally clean even at ten times magnification (flawless). This beautiful cabochon gem was hand-crafted in the U.S.A. from natural color blue aventurine quartz lapidary rough (popularly known as "blue denim quartz"). These genuine cats eye quartz oval shaped cabochon gems are 100% natural cats eye quartz. They measure 20x15mm and weigh 17.5 carats each. These naturally chatoyant quartz cabochons are completely natural and have not been heated or treated in any way. They have silvery-gray natural color, and are sometimes known as silver cats eye quartz. In Asia, this naturally chatoyant quartz is very popular as a good luck gem and it is known as toad's eye. See also another view of these genuine cats eye quartz gemstones. This fine quality collector gem of natural chrome diopside is completely natural, it has not been heated or treated in any way. This chrome diopside gem shows a very fine medium dark green color. This natural color chrome diopside gem is well-cut. This superior quality collector gemstone of natural color chrome diopside is completely eye clean even under close inspection with bright illumination. This chrysoberyl gemstone faces up eye-clean. It has faint natural inclusions which are only visible under very close inspection. This small gem has rich slightly golden yellow natural color under daylight. This natural color chrysoberyl gem faces up eye clean with faint natural inclusions only visible under very inspection. It has very rich chartreuse (greenish-yellow) natural color. This beautiful gem is very well cut with good brilliance. This 3.01 carat chrysoberyl gemstone has rich yellow natural color under daylight. This gem has very faint natural inclusions which are only visible to the eye under close inspection. It is very well cut with fine brilliance. 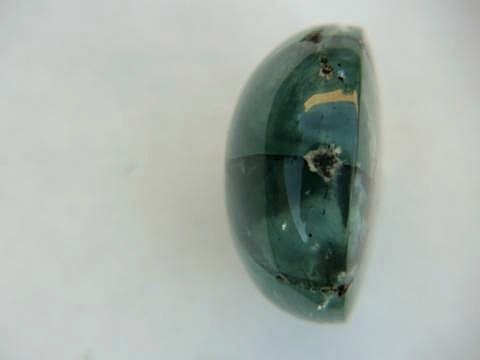 This rare quality chrysoberyl cat's-eye gem was mined in Ceylon (Sri Lanka), where it also was hand-ground and polished into this oval shaped cabochon gem. The cat's-eye is very sharp, and it is well-centered. 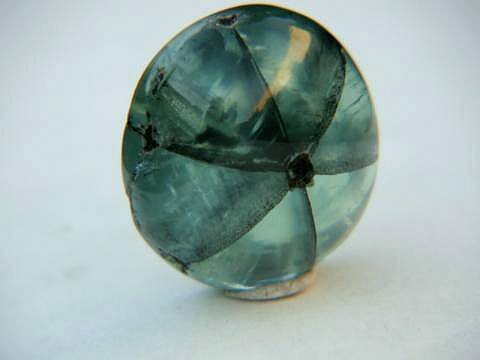 This is a natural chrysoberyl cats eye gem - it is unheated and untreated. It is translucent with natural grayish green color. It faces up very consistent with no inclusions! 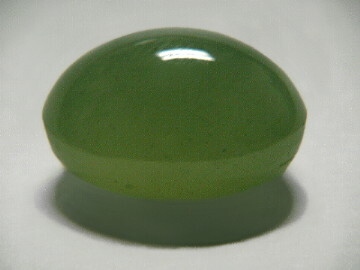 The back side is flat with natural rough surfaces (see a back view of this chrysoberyl cats eye gemstone), and it has a relatively low profile with no extra weight. See a side view of this genuine chrysoberyl cats eye gemstone. See also an opposite side view of this extra fine quality chrysoberyl cats eye gem. Our mineralminers.com special offer price for this rare quality cat's-eye chrysoberyl gem is $1750/carat = $11375. This natural color citrine gemstone has some very faintly visible tiny natural inclusions (GIA: TYPE I Gem, Clarity Grade SI). This unheated gem has light yellow natural color. It has not been heated or treated in any way. This natural color citrine gem is very well faceted in a long triangular cut. It was handcrafted from a natural color light yellow quartz crystal that was mined in Brazil. This wonderful citrine gemstone is completely eye clean (GIA: TYPE I Gem, Clarity Grade: VS), and it measures 1.5 inches long. Under very close examination it shows very faint phantoms inside! These phantoms are also faintly visible when the gem is turned upside down on a piece of white paper. See an upside down view of this natural citrine gemstone. These natural phantom inclusions absolutely guarantee the natural origin of this citrine gem. This beautiful citrine gemstone has fine golden-yellow citrine color. This unique citrine gemstone is very well cut with good brilliance. It was faceted from golden-yellow quartz crystal rough that was mined in Brazil. This natural color citrine gemstone is completely clean under magnification (GIA: TYPE I Gem, Clarity Grade Flawless). This unheated gemstone has very fine natural golden-yellow citrine color. It has not been heated or treated in any way. This untreated citrine gemstone is very well cut with good brilliance. It was faceted from natural color golden-yellow quartz crystal rough that was mined in Brazil. This rare collector gem of natural color change garnet is completely natural, it has not been heated or treated in any way. This natural color change garnet gemstone is lightly included, and the gem faces up clean. It is very well-cut with good brilliance. This rare collector gem displays a natural color change from a light to medium grayish green when viewed with indirect sunlight, to a light gray green color with brown-purplish flashes under direct sunlight, to a fine reddish-pink when viewed with incandescent light. The photo at left shows views under indirect daylight (upper photo) and an incandescent light view (lower photo). This rare collector gem of natural color change garnet is completely natural, it has not been heated or treated in any way. This rare gemstone is lightly included and faces up clean. It is well-cut with good brilliance. This rare collector gem displays a natural color change from a medium dark gray-green when viewed with indirect sunlight, to a light green-gray color with red-purple flashes under direct sunlight, to a fine reddish-purple when viewed with incandescent light. The photo at left shows views under indirect daylight (bottom photo) and an incandescent light view (top photo). This rare collector gem of natural color change garnet is completely natural, it has not been heated or treated in any way. This rare garnet gem displays a very strong natural color change from a darkish forest green when viewed with indirect sunlight, to a dark reddish-purple when viewed with incandescent light! This natural color change garnet gem is well-cut slightly shallow so it faces up large for its weight. This rare collector gemstone of natural color change garnet faces up eye clean with faint natural inclusions visible under close inspection. The photo at left shows views under indirect daylight (lower photo) and an incandescent light view (upper photo). This rare gemstone of natural color change garnet is completely eye clean, and it is very well-cut with good brilliance. This rare collector gem displays a very strong natural color change from a medium-dark green when viewed with indirect sunlight, to an olive green color with reddish-brown flashes under direct sunlight, to a purplish-red color when viewed with incandescent light. The photo at left shows views under indirect daylight (top photo) and an incandescent light view (lower photo). This rare collector gem of natural color change garnet is completely natural, it has not been heated or treated in any way. This rare collector gem of natural color change garnet is completely natural, it has not been heated or treated in any way. This rare garnet gem displays a very strong natural color change from a dark blue-green when viewed with indirect sunlight, to a rich dark reddish-purple when viewed with incandescent light! This natural color change garnet gem is well-cut slightly shallow so it faces up large for its weight. This rare collector gemstone of natural color change garnet is eye clean with faint natural inclusions visible only under very close inspection with bright illumination. The photo at left shows views under indirect daylight (lower photo) and an incandescent light view (upper photo). This rare quality gemstone of natural color change garnet is totally clean to the eye, and it is well-cut with good brilliance. This rare collector gem is completely natural, it has not been heated or treated in any way. This natural color change garnet gem displays a natural color change from a dark gray-green when viewed with indirect sunlight, to a dark grayish body color with red-purple flashes under direct sunlight, to a fine dark purplish-red when viewed with incandescent light! The photo at left shows views under indirect daylight (right photo) and an incandescent light view (left photo). This rare quality gemstone of natural color change garnet is totally clean to the eye even under very close inspection. This rare collector gem displays a natural color change under different types of lighting: with indirect sunlight it has a grayish olive green body color with brown reflections at each end (see lower photo at left), under direct sunlight it shows a light brown body color with rich red flashes, and under incandescent light this rare gem shows fine purplish red color (top photo at left). This rare quality collector gem of natural color change garnet is completely natural, it has not been heated or treated in any way. This is the end of page 1 of our Gems of All Minerals virtual gallery pages. See also our page #2, page #3, page #4 and page #5 of our Gems of All Minerals pages. To see our entire inventory of a different category, just select it from the table below. To see photos of a particular mineral variety, simply select any mineral name from our Mineral Inventory & Factsheet Index. Would you like us to inform you when we add more superior quality natural gemstones on this page? We have an extensive inventory of rare and unusual natural gemstones that are not yet being displayed on our website, so be sure to let us know if you have any special requests. Please contact our webmaster or our 'site' geologist with any questions or comments. © Copyright 1998-2016 Gem & Mineral Miners, Inc.® All Rights Reserved.